We help brokers deliver an experience their clients love. 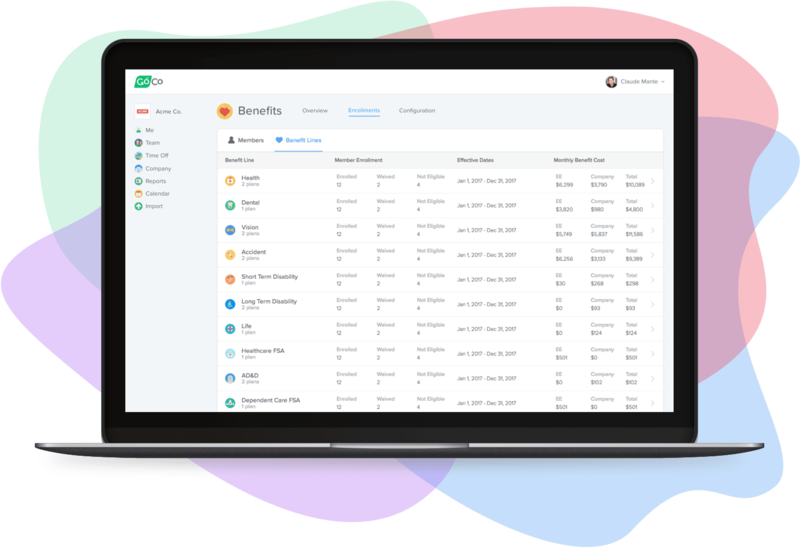 GoCo empowers brokers with a Modern HR & Benefit platform that's been proven to win new business, delight existing clients and help reduce workload. It’s a new age where employers and employees expect more out of their HR and Benefits software. 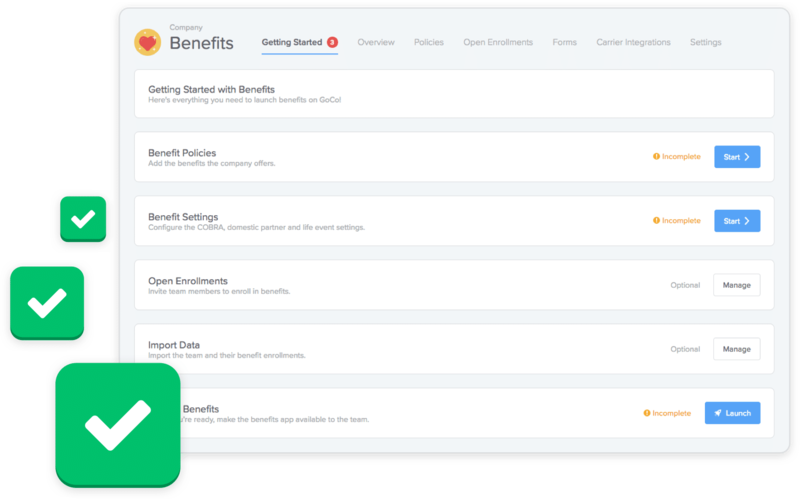 GoCo has built features that companies across the country love such as easy hiring & onboarding, document management, time off management, compliance tracking and more. The best part, all of the client’s data is kept perfectly in sync with benefits and payroll! We understand the pain of managing benefits. Processing benefit enrollments, ensuring employees get enrolled on time, and getting all the paperwork filled in and signed is a hassle. 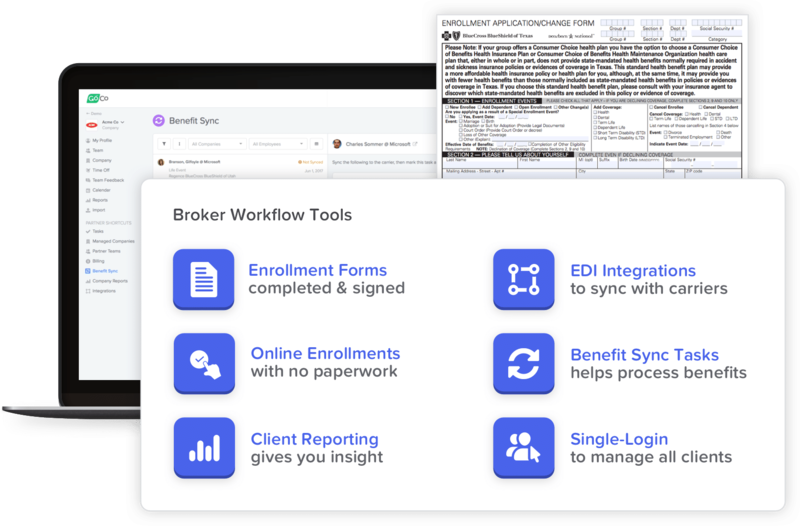 GoCo has built all the tools to maximize efficiency for brokers such as online employee enrollments, carrier form generation, carrier EDI feeds, and a benefit sync dashboard that combines all processing tasks into one place. You’ll get a dedicated GoCo expert to help you with every step in implementing your clients. Questions from your clients about how GoCo works can all be directed to our trained support staff allowing you to focus on what you do best. We know that learning new software can be daunting. To address this we give you everything you need to implement your clients quickly and efficiently. A single checklist outlining what information is required helps keep you on track. Backed up by your dedicated GoCo expert, there no guesswork of what’s needed to launch! Keeping track of all your clients and their employee’s information can be a hassle. 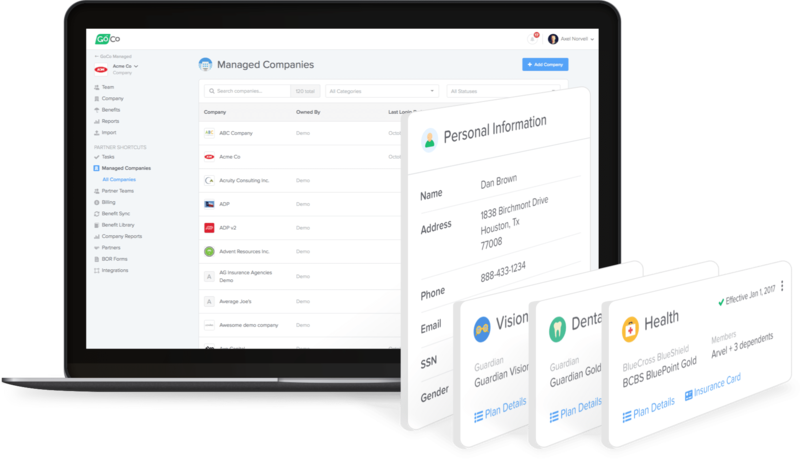 GoCo gives you a single login to manage all of your clients and employee information from one spot. No more digging up information about your clients — it’s all organized and accessible from your own personal Partner Account. Ease of use and clean look. I’m the administrator for my company’s GoCo account and it’s super easy to get new employees onboarded and enrolled in benefits. We were using digital e-forms for benefits enrollments and I’m so glad to have an automated system for employees to elect insurance! "If you are looking for a one stop HR portal - look no further than GoCo"
I love the fact that not only does it integrate with our Slack platform - it is very comprehensive as far as managing our HR systems. It keeps our team organized - we can see benefits, documents, vacation and other time off requests in one place. It makes our new employee onboarding a breeze! "Cleaned up a lot of our scattered hr processes"
"Great software for office management"
I like that the time-off request is very easy to use for me and my manager. We are also going to use it to rack one-on-one's. We do use it for healthcare and benefits enrollment and management. So far it's been so easy to use! If you’re a broker wanting to deliver an amazing experience for your clients, we think you’d be a great partner. A turn-key solution for brokers who want to deliver the GoCo experience to their clients without having to manage it. Let GoCo handle all product demos, implementations, and training for your clients while you sit back and take all the credit! Offer GoCo to clients at market price. Receive a % of GoCo Premium upgrades from your clients. A self-managed solution for brokers who want to fully license and operate the GoCo experience for their clients. Broker handles all product demos, implementations, and training directly with their clients, and GoCo provides the tech platform and supports your team to success. Offer GoCo to clients at a reduced price. Receive a % of GoCo Premium upgrades from your clients. 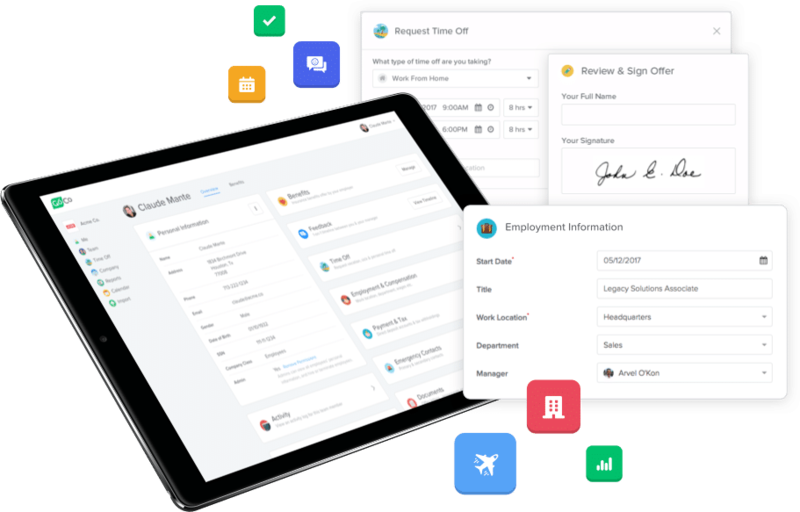 Features designed to delight your clients by addressing their needs around HR, Benefits and Payroll Sync. A real-live dedicated expert that will work with you and your clients directly to help with every step along the way. No more scattered management of clients. A single login account lets you and your agency team manage all your clients. Expert advice and support that addresses the questions and concerns you and your clients have. Webinars for brokers and their clients. 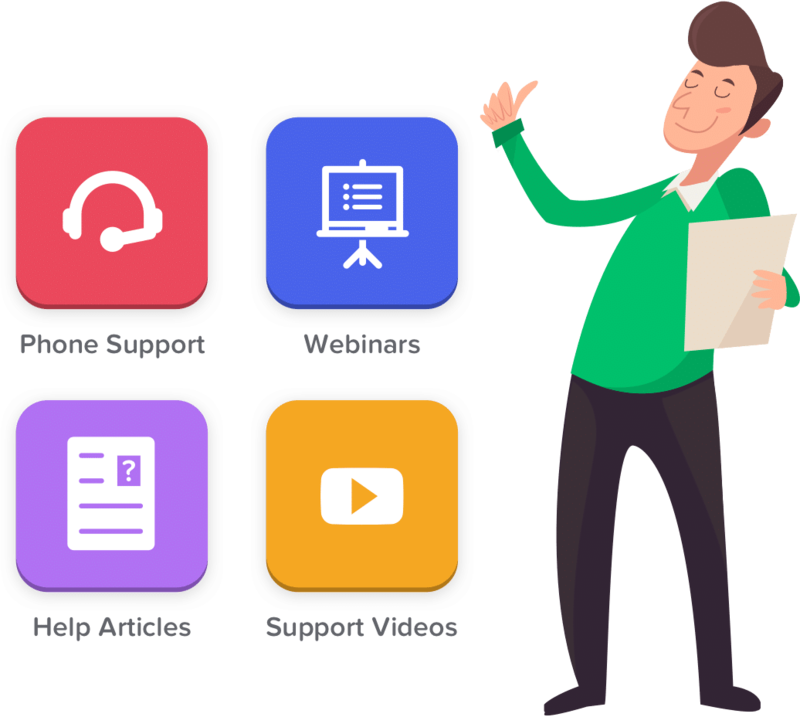 Set your team and clients up for success by inviting them to our webinars that demonstrate the value of GoCo's platform in everyday business. Win new business with marketing and sales collateral that will make your broker agency stand out from the competition.